“By invitation a meeting was held at the home of Mrs. George P. Lowell, 525 Walnut Street, Newtonville, November 21, 1907, for the purpose of considering the organization of a Chapter of the Eastern Star. About twenty-five gentlemen and ladies responded. A petition was circulated and December 2, 1907, a meeting of the petitioners was held at the Masonic Temple, which has been our home ever since, and under the instruction of Brother Harry Mason White, Grand Patron, a name was chosen, officers selected and arrangements made for the Institution of Palestine Chapter on December 14, 1907, when, despite the severest snowstorm of the winter a large and distinguished party of Grand, Past Grande, members and would-be members met for dinner in Temple Hall — and in those early days of motor transportation it was considerably more of a problem than now to cover the distance between the several villages of Newton and from Boston to the country, especially through winter storms. With four hundred in attendance, on June 17th, 1908, the Chapter was constituted. Representatives of twenty-four chapters were present. At this time the Chapter enjoyed the distinction of being the only Chapter in the jurisdiction to feature Robes. They were worn atop the voluminous dresses of the period, — and never had a chill, and the delight of winding the Labyrinth with seven to ten candidates and a yard or two of train is quite beyond the conception of present-day Conductresses. However, they were very lovely and lent dignity and grace to the ceremonies, attracting visitors from far and near. 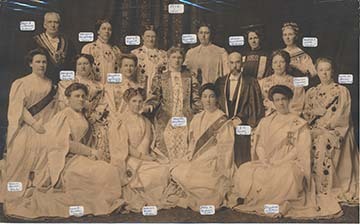 Pictured below the officers of 1910. With less than one hundred members in the first three years, the lowest members’ attendance recorded was 47. With a rental expense of $500 a year and dues at $5.00 each, balancing the budget was even then a momentous question. The Chapter has met the various responsibilities, fraternal, civic and philanthropic, which have come to us all with the years. In the World War our service flag held seven stars, our Worthy Patron of 1917 having responded to the first call for volunteers, while those at home enrolled in the work of Red Cross supplies, Liberty bonds, canteen service and all the activities of that hectic period. Shortly after the close of the War we cooperated with the Masonic bodies in their efforts which resulted in clearing the mortgage indebtedness on this, our beautiful Home. To continue reading our history, view our 100th Anniversary program.